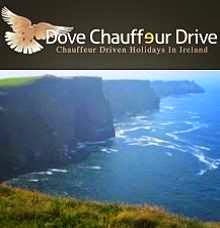 HOLIDAYS in IRELAND: Chauffeurdriven Irish tour sets new record? Chauffeurdriven Irish tour sets new record? Is this the youngest baby ever to embark on a chauffeurdriven tour of Ireland? Baby Harper, pictured here with her lovely Mom Nikki, is just eleven weeks old, and just about as good as any baby could be. They arrived at Shannon last Saturday to begin their tour of the south and south west of Ireland with me, and she has been an angel ever since then. Personally, i have never toured with a baby this young, and indeed ,never come across one on any other tour either so, maybe we have a record here. Nikki is traveling with her husband Chrism and her Dad Tim, and our first destination was Kinsale, where we spent two nights in the lovely Kinsale Carlton Hotel. In the picture above, we have, from the left, Tim, Nikki, and husband Chris, holding baby Harper. Isn't she so cute? This morning we made our way to Killarney,and here we have Nikki, pictured at the famous "Ladies View", high in the mountains over the lakes of Killarney. Poor Harper was feeling the chilly air up there today, but she was still as good as gold. Here we are, all together, back in the Killarney Plaza Hotel, with Harper looking a lot warmer, and all wrapped up in her nice little wooly bonnet. The Plaza is a fine hotel, and ideally located, right in the heart of this great town. Castles were high on my guests agenda, and Ross Castle, situated on the shores of Lough Laune in Killarney,is a fine example of a old Norman Tower castle. Unfortunately they were in the shade of some trees, and the light did not help this photo. Harper was also all snuggled up in her her little harness. We also had a really nice visit to Quinlan's Fish and Chip restaurant, in the centre of Killarney, a place second to none if you want the best and freshest of fish and sea food. I recommend this place highly. Tomorrow we head for the Dingle Peninsula, one of my own personal favourite places. Make sure to follow along as we enjoy our journey through some of Ireland West's most Wild and beautiful places, now commonly known as "The Wild Atlantic Way".